Happy Monday, Kittens! I hope you all had a good weekend. My Saturday was pretty busy—I started out with a fitting at the dance studio, and then it was straight to the show choir competition for the rest of the day—but yesterday was pretty restful. I went to the university choir concert in the afternoon, and then caught up with a friend for a little bit, which was really nice. It's been such a long time since I've touched these socks—and it's been even longer since I shared them with you—so I decided to share them today in the hopes of shaming myself into working on them some more. 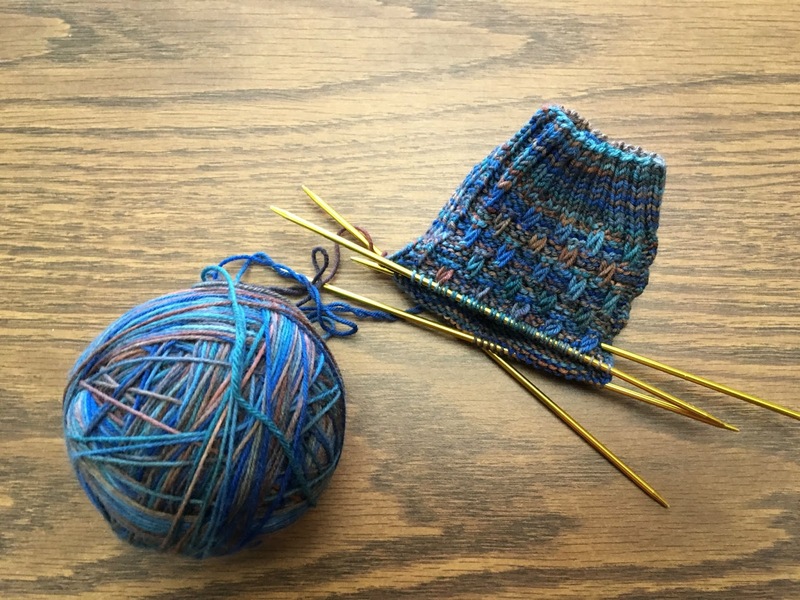 I'm knitting these for the Juntos KAL, which ends March 15th, so I'm not quite in the danger zone of not finishing on time yet, but I will be soon if I don't get a move on. Considering that I've abandoned all hope of finishing my second Old Harry anytime soon, it'd be nice to finish at least one KAL on time this year. 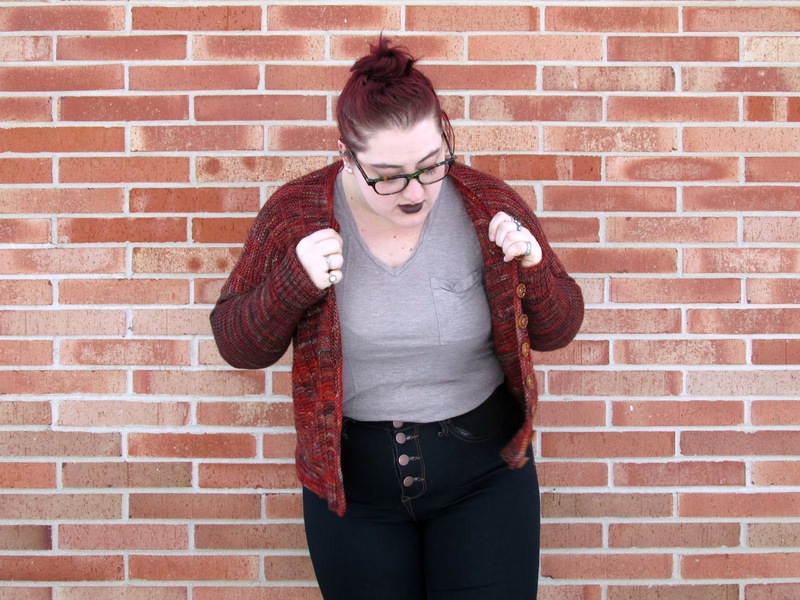 Look at all that lace! 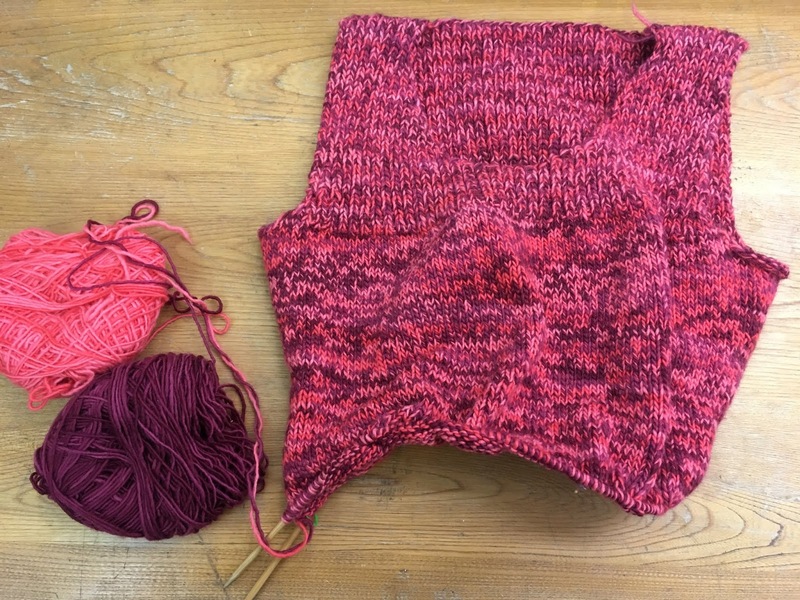 This has been my evening knitting project this week, and I've definitely made a lot of progress. 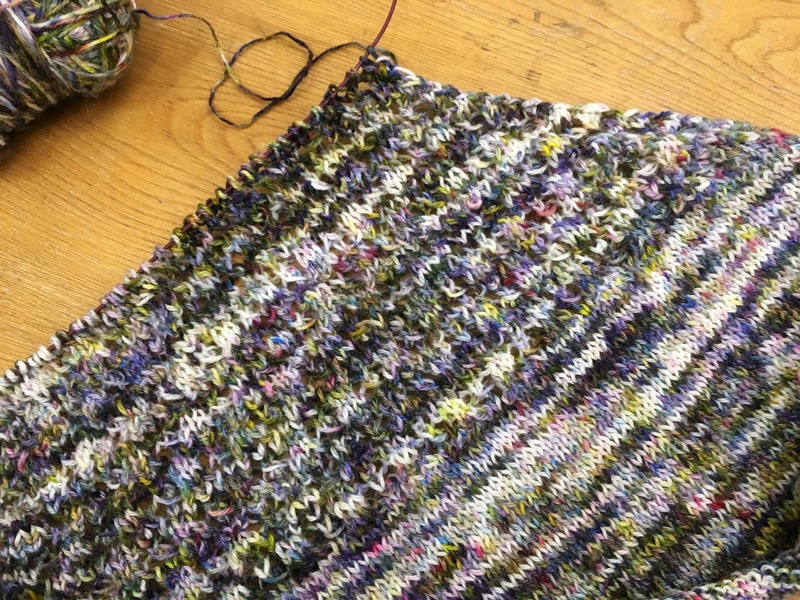 There's still tons of shawl to go, but I'm really enjoying watching this grow, and I know it's going to be beautiful when it's finished. 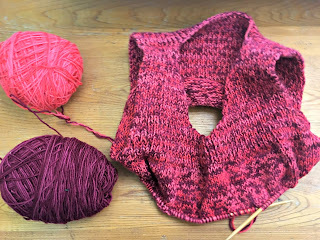 I'm really struggling to see the lace pattern now, but I know it'll block out and look great. We're supposed to have a show choir competition here in town tomorrow, but we also might be getting a bunch of snow. I hope the competition isn't cancelled, but I also don't want a couple hundred high school students and all their families to get snowed in here in town, so we'll see how that plays out. This week I got a stack of alterations done on dance costumes, and I have one more quick fitting at the studio scheduled for tomorrow morning. Right now everything in my studio is covered in glitter from some tutus that had to be taken in, which I know would frustrate plenty of people (I, however, love glitter, and I think it's fantastic). My studio was already a mess before I brought this pile of costumes home to work on, and I'm looking forward to getting them out so I can maybe tidy up a bit and make that room more functional again. I figured out the trick to making progress on this sweater, and it turns out I just have to actually knit it. Wild, I know, but it's amazing how much more body I have since I've been actively working on this again. 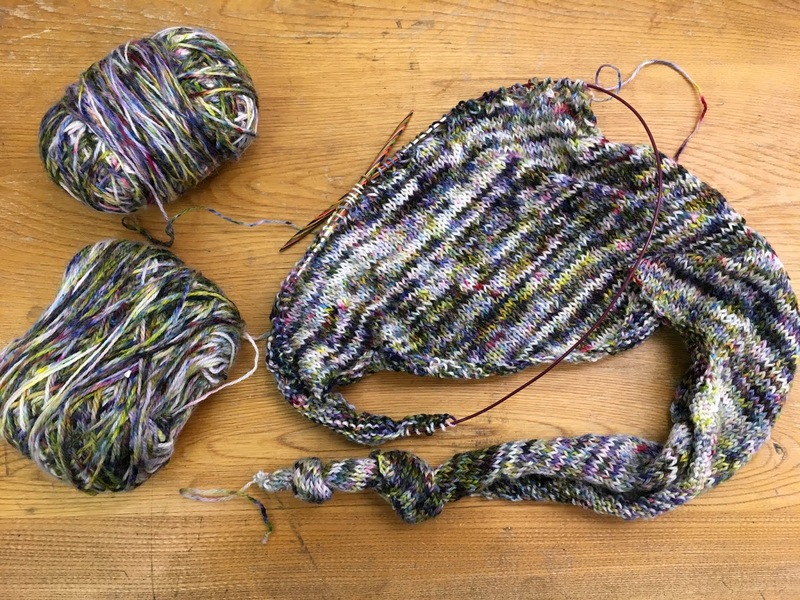 I'm about halfway through the lower body increases, and it's really starting to look like a functional garment. 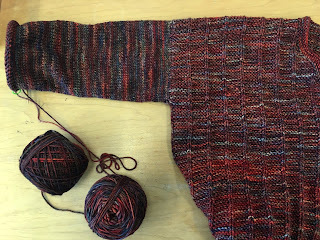 I don't think I'm going to finish this by the time the Wayward KAL ends on February 28th, since I still have both sleeves to go, but that's all right—there's still plenty of winter left to enjoy this once it's done! It's been a pretty quiet week here. I went to my mum's last night for dinner—ranch chicken, baked potatoes, and spinach and mushrooms—and then overnight we got a bunch of snow. The snow is currently deeper than the tops of my boots, and my jeans are soaked right now. I'm currently feeling a little bit overwhelmed by my current WIPs. 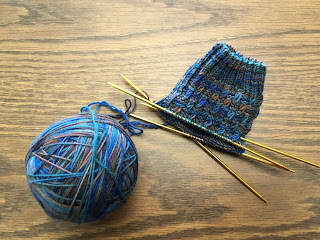 I have a bunch of things on the needles that I'd like to finish, and I'm currently juggling three or four pattern samples, and it just all feels like a lot. I think I might take the next couple of weeks to just buckle down and get some things finished, but we'll see what happens. 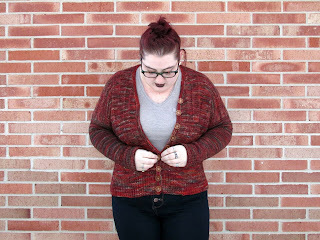 I love easy-to-wear cardigans in simple shapes, and Jeri fits the bill exactly. 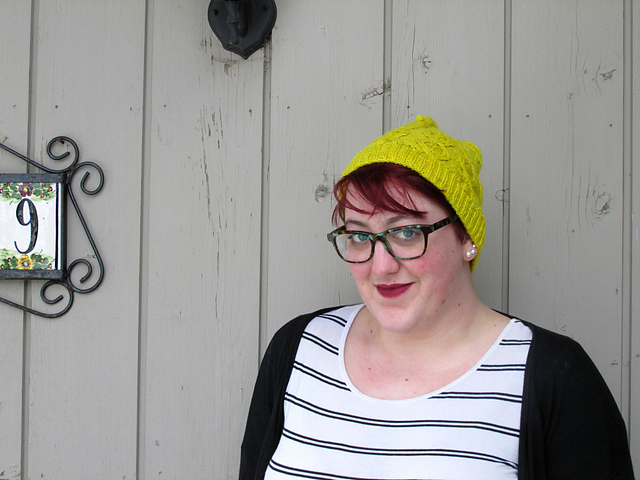 Featuring a boxy, textured body with fitted sleeves, Jeri is equal parts classic and modern and is easy to wear as well as enjoyable to knit. Jeri is worked seamlessly from the top-down with long fitted drop sleeves. 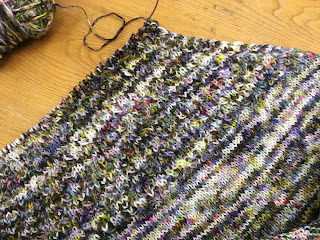 The texture pattern on the body is an easily-memorized two-row repeat. Jeri is intended to be worn with 4-8in/10-20cm positive ease and is shown in size 50in/127cm on a model with a 43in/109cm bust. Jeri is 20% off on Ravelry through Thursday, February 21st! Maybe this year is the year for breakthroughs on longstanding design ideas, because they just keep coming. 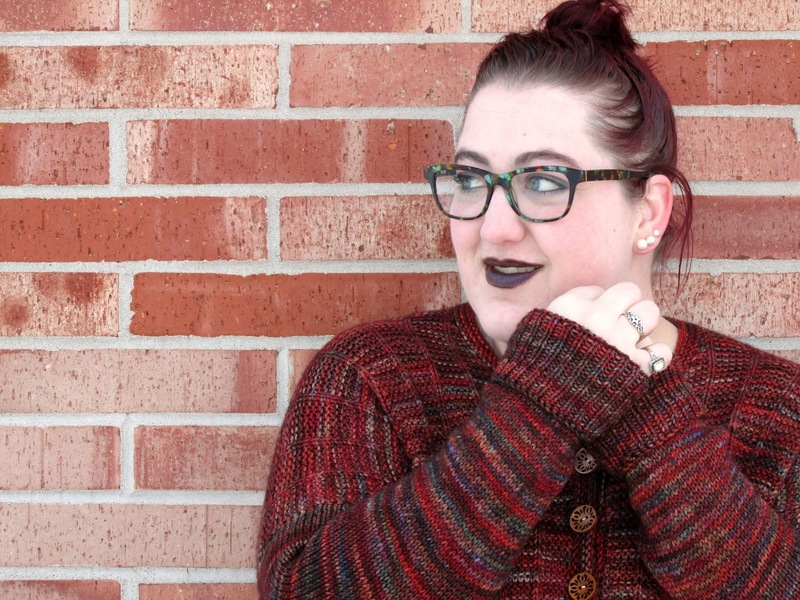 I've had this yarn for a few years, and I knew I wanted to design a shawl with it, and I knew what I wanted the shawl to feel like, but I never quite got it there. I even cast on for it two different times, but neither was quite right, and then a few weeks ago, it all came together. I'm really enjoying knitting this shawl so far—I've only just started the lace pattern, and I'm really excited to see it grow. I admit, it feels kind of weird to be juggling this with my other current shawl sample, but they're pretty different from one another, and for now I'm okay switching between the two. 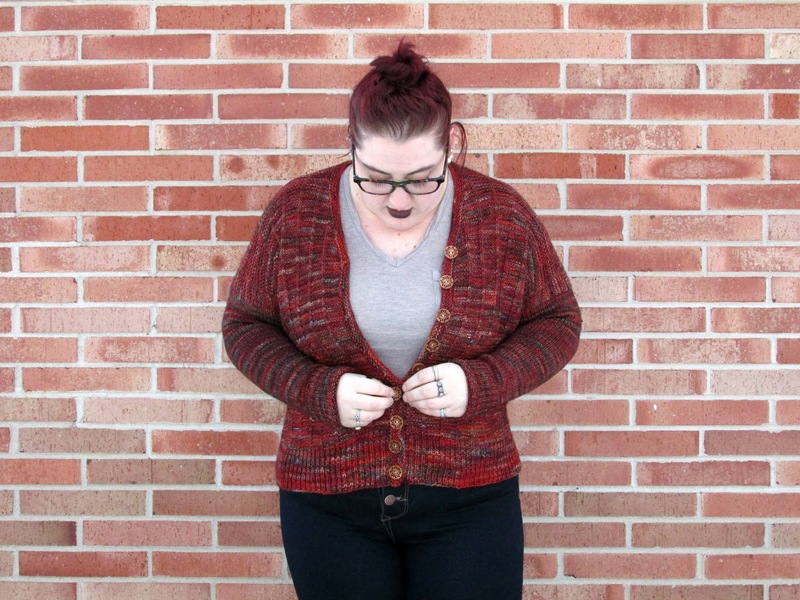 This weekend we're supposed to get snow, so I'm going to hole up in my apartment and put the finishing touches on my new cardigan pattern and get pattern photos taken. The pattern will be going live the beginning of next week, so stay tuned for that. My big, exciting not-work plan for this weekend is to watch the Lord of the Rings trilogy, since it's been a few months since I last did that, and I have a cowl that I've been knitting for a while now that's almost finished and that I'd like to get off the needles while it's still winter. This week already feels so long, and it's only Wednesday morning! Fittings at the dance studio have been going well so far, but I still have a pile of glitter-shedding tutus in my studio to take in. Tonight's my one night off this week, so I'm planning on playing hooky from choir practice and staying in. I'm looking forward to eating dinner at a real table for a change, and maybe I'll throw on Netflix or a podcast. Or maybe I'll lay in bed and read. The possibilities are endless. I'm afraid I haven't been working on my Old Harry for the Wayward KAL as much as I'd like to have been. I'm almost done with the waist decreases now, and hopefully I can get a few more body rounds banged out this week. I don't know if I'll actually be able to finish this sweater this month, but there's still three weeks, and it's a pretty small sweater. Oh, gosh, I've missed you all! Last week ended up going a bit off the rails, with the polar vortex (The university closed! For two whole days!! ), and I just never managed to sit down and write to you all. 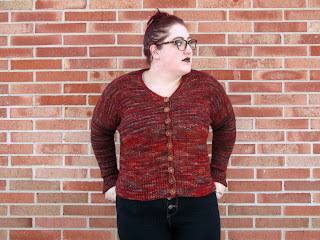 I spent a lot of time reading and working on this sweater sample, and I'm very pleased with my progress. I have two inches and the cuff left on the first sleeve, and then I'll just have the second sleeve to go. 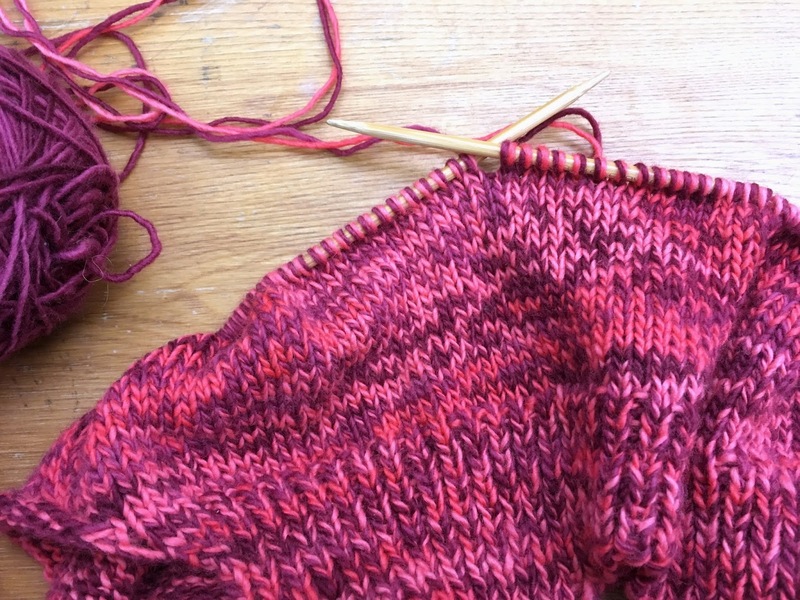 (I have this nifty trick where I knit the buttonband as soon as I bind off the body, so that way when the sleeves are done, so am I.) 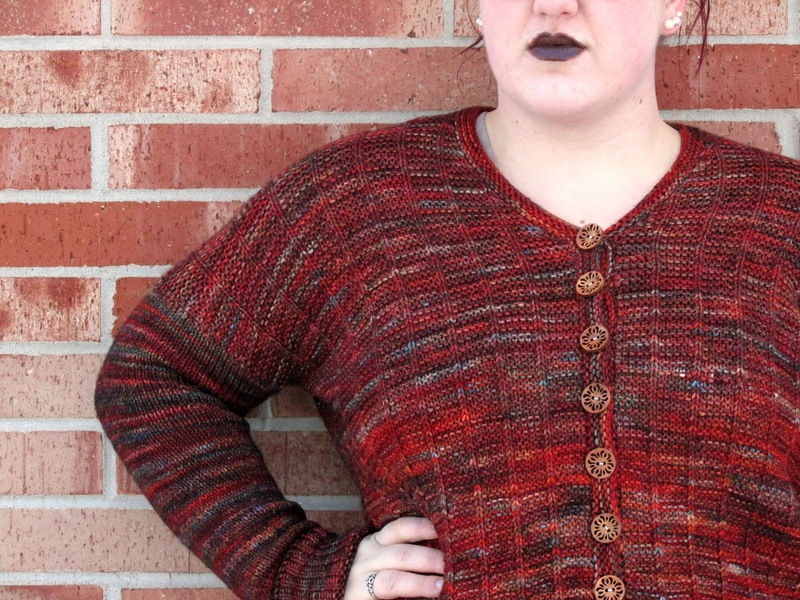 I got most of the pattern written on Saturday, and I'm hoping to be able to send it to my tech editor this weekend. This week is going to be pretty busy: we were going to fit costumes at the dance studio last week, but then we ended up closing due to the cold, so today and tomorrow after I get done at the library I'll be heading straight over to the studio. I'm also participating in a talent show this weekend, and we have a run-through for that on Friday.